Flying the flag for all Holiday Inns, this 4* hotel ensures the chain’s consistent first-rate quality. Whilst loyal to the Holiday Inn brand, elements of the hotel strongly reflect the local Piemonte traditions, giving guests a real taste of Turin’s culture and history. The staff provide a warm and friendly welcome and promise to attain a high-level of service throughout your stay. The hotel is conveniently located within a few minutes’ walking distance of the Porta Nuova station, where buses leave regularly to Turin Caselle Airport. The hotel is a ten minute stroll from the Via Roma, where you will find Turin’s high end shops, boutiques and restaurants, nestled amongst the reminiscent Baroque architecture. The hotel offers prime location and acts as a perfect base for your stay in the region. 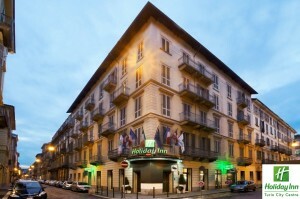 This 4* hotel includes all the expected services and amenities of a Holiday Inn, from a concierge service to free WIFI throughout the hotel. The restaurant and bar boasts superb cuisine and an extensive range of wines to whet your palate. A plentiful breakfast is served in the restaurant’s relaxing courtyard garden, overlooking tropical plants and beautiful Italian architecture. 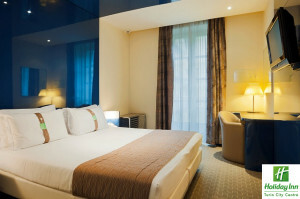 The modern, yet cosy rooms radiate relaxation and quality. A home from home, the hotel guarantees a comfortable night’s sleep, leaving you refreshed and ready to explore the wonders of Turin. Every room includes a cable/satellite TV, dual-line telephone, free WIFI, tea/coffee making facilities and a mini-bar.